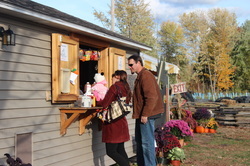 Enjoy Lunch/dinner on the Farm - full concessions are available with fun fall foods including Kettle Corn, Smore kits, Stalking Tacos,Hot Dog stand, Pumpkin sippers for the kids, hot chocolate, hot cider and more! Smore kits so you can enjoy making your smores on our fire! Enjoy hot dogs fresh and ready at our hot dog stand! Pumpkin sippers for the kids to enjoy filled with apple juice or apple cider!